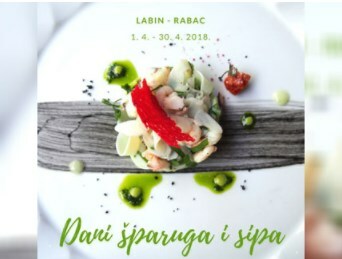 Labin Spring Gastro Rhapsody lasts for the whole of April. As part of Days of Asparagus and Cuttlefish it offers special menus which include traditional Istrian spring ingredients. Risotto with cuttlefish sauce, beefsteak in asparagus sauce, brodetto with cuttlefish served with polenta, asparagus cream soup, apple and asparagus strudel cake and even candied asparagus, are just some of the specialties and spring gastro news available from nine restaurants: Kvarner, Velo Kafe, Ferali ,Tina and Due Fratelli in Labin, Rapčanka in Rabac, Dorina in Plomin, Nando tavern in Trget and Tomažići in Nedešćina. Check the menus, choose your favorite dish and book a table.